Who Is Evan McMullin and Why Is He Running for President? This month saw another presidential candidate throw his hat in the ring. Independent candidate Evan McMullin, 40, has quite the resume, and he is hoping that that will allow him to overcome the minimal name recognition he starts off with. I did some research about him to answer some of the questions most people probably have about his candidacy. Hopefully this question and answer format will give some insight into the man who would become both our first Mormon and youngest president. McMullin was born in Provo, Utah (which is also home to both Brigham Young University and the band Neon Trees), and he attended BYU as an undergraduate (I will always be a huge fan of BYU after the years I have spent at Chinese camp there). His passion from his days as an undergrad until now has clearly been international relations. Towards the end of his time at BYU, he was a Boren Scholar in Israel, which he thought was the “perfect capstone to the traditional coursework I had done in Provo.” McMullin also spent time in Damascus in the early 2000s, which helped fuel his love of the Syrian people. He was also a missionary in Brazil, although I don’t see any record of him commenting on the Rio Olympics. What has he done in his career? In addition to the ten years he spent at the CIA under cover, where he “managed clandestine operations related to counterterrorism, counterinsurgency, energy, political stability, and counterintelligence, while serving mostly in hostile environments,” he worked at Goldman Sachs, and was also a volunteer in Jordan for the United Nations High Commissioner for Refugees, where he “vetted and processed UN-recognized refugees from the Middle East and Africa for resettlement to third countries.” He most recently served as the Chief Policy Director for the House Republican Conference. His LinkedIn lists his specific areas of focus as being “foreign affairs, national security, technology, health care, finance, government reform, natural resources, and women’s empowerment.” While working in Congress, he arranged for Caesar, an anonymous defector from the Bashar al-Assad regime in Syria, to testify about human rights abuses committed by the Assad regime, including “10,000 extra-judicial killings within Assad’s prison system.” McMullin spoke about this in a recent Ted Talk, which was his highest profile appearance before launching his presidential campaign. The slogan of his campaign is that “it is never too late to do the right thing,” and that explains it fairly well. He knows that he is late to the game, but he doesn’t want to sit back and complain. His campaign has already attracted support from a lot of donors and staffers that it will need to gain traction, so it is apparent that he is not alone in this belief. Does he like Donald Trump? Does he like Hillary Clinton? The fact that both Trump and Hillary have such historically low poll numbers suggests that McMullin will be able to garner support from even those who disagree with him on most of the issues. Text from a former Bernie staffer: "Really considering supporting @Evan_McMullin. May disagree with him but Hillary and Trump are evil." Will he be on the ballot across the nation? This is an excellent question, considering that several states have already had the deadlines to appear on the ballot pass us by. Within a few days of launching his candidacy, he has already secured spots on the ballot in Colorado and Minnesota. The aforementioned support of Better for America is crucial, because the organization has spent months laying the groundwork for a third party bid to get ballot access. It is still an open question as to whether he will appear on the ballot in all 50 states, but he has momentum. A county clerk staffer in Utah said that the verify rate of over 90% of the campaign’s signatures is “unheard of,” although, anecdotally, my signatures for my Ward Committeeman race were definitely in that ballpark. His Minnesota strategy is interesting, because he is on the ballot as the Independence Party’s candidate, as opposed to just being an Independent. This could suggest that in states like New York he will work for the nominations of the Conservative Party, in addition to appearing as an Independent. 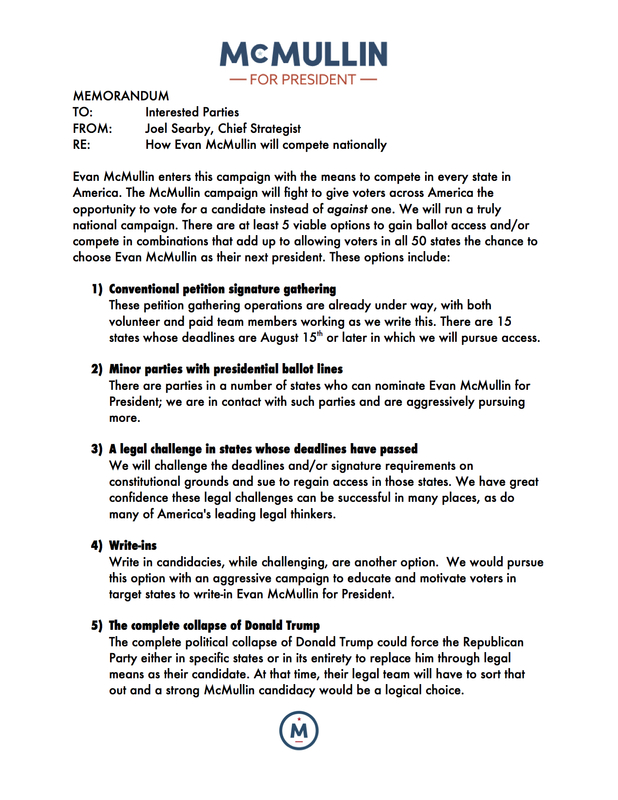 His campaign laid out a five point plan for how to overcome ballot access, that even includes legal action against those states that have seen their deadlines pass. Evan McMullin’s plan for nationwide ballot access. PPP, one of the largest polling groups in America, has already asked if they should include him in their upcoming Texas poll, and based on the results from their Twitter poll, it looks like they will do so. Ok here's a flash poll. Should we include Evan McMullin in our Texas poll, or not? How will he overcome his low name recognition? Who will be his Vice President? We don’t know at this moment. However, McMullin filed with Nathan Johnson as his Vice Presidential candidate in Colorado, although Johnson is apparently a stand-in while he finds his real running mate. McMullin has told Freedom Crossroads that his running mate will be pro-life, but that is about all the information that we have. Will Members of Congress endorse McMullin? This is an open question. He probably has strong relationships with a lot of Congressmen given his time at the House Republican Conference. However, no one has announced an endorsement, and many of the likely anti-Trump members have already made their plans known. Congressman Scott Rigell has endorsed Gary Johnson, Senator Mark Kirk has announced that he will write in Colin Powell, Congresswoman Ileana Ros-Lehtinen has said that she will write in Jeb! Bush, and so on. McMullin has the best chance of convincing the members who are planning to write someone in to support him, as well as those who have simply said that they will vote for neither Trump nor Clinton, such as Senator Susan Collins. Given his Utah roots, it is logical for McMullin to heavily contest Utah, and he has already said that he will do so. This means that an endorsement from Mitt Romney could be in the cards for him, and would be a game changer for his campaign. Back before the Utah Caucus, Romney urged Utahns to caucus for Ted Cruz, and told voters across the nation to vote for Cruz or John Kasich based on which candidate was more likely to carry any given state. Why vote for Evan McMullin and not Gary Johnson, the Libertarian Party’s candidate for president? One of the reasons he believes Libertarian party nominee Gary Johnson is a nonstarter as an alternative is the former New Mexico governor’s position on religious liberty, which McMullin calls “awful” and dismissive of our founding. “The other thing is, if Gary Johnson were president we’d have to drug test him once every four months,” adds McMullin. Johnson has not been smoking while on the campaign trail, and has said that he will not smoke as president, but clearly he has not yet convinced McMullin that that is true. Previous Previous post: Fun Facts for International Lefthanders Day!